On evolution, genetically-modified foods, animal research, and global climate change, America’s scientists are almost all going one way—and the general public is going the other. 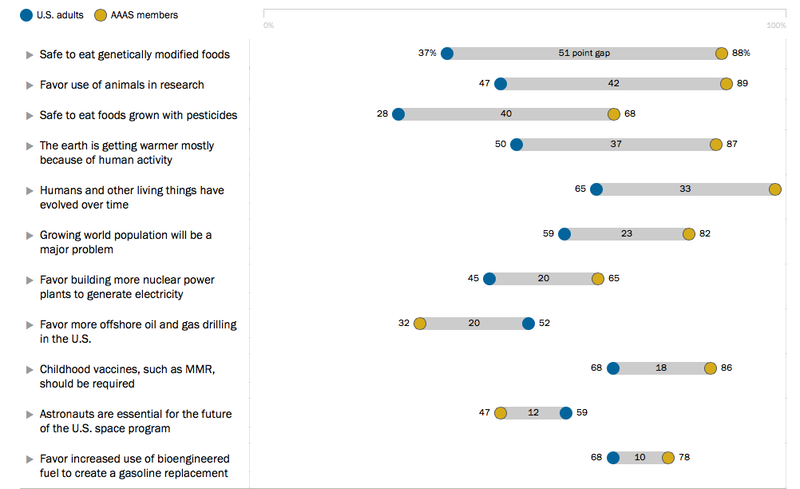 This graphic from the Pew Research Center looks at the gaps between opinions on scientific issues, by contrasting surveys first given to members of the American Association for the Advancement of Science back in January with surveys given to the general public. There are some strong opinion gaps, but the most concerning areas are not just those where there’s a gap. They are the areas where a scientific consensus clearly exists—with scientist opinions trending firmly to the right—but where public opinion not only hasn’t caught up, it appears to be strongly divided. Evolution, for instance, was supported by a full 98% of the scientists, but just two-thirds of the general public. A very similarly-sized gap was found between scientists and the public on the existence of global climate change. The single biggest gap of all, though, was in the safety of genetically-modified foods, which 88% of scientists agreed were safe to eat, but just barely a third of the general American populace felt comfortable with. Of course, on a few issues the bridge between scientists and the general public was not so far—bioengineered fuels, for instance, enjoyed fairly close levels of support from scientists and the public alike. So perhaps the next stop is to figure out exactly why scientists are winning there, but losing in the other areas.